Former U.S. Sen. Kay Bailey Hutchison of Texas told a panel of Senate lawmakers on Thursday that she will take a hard line on Russia if she is confirmed as ambassador to NATO. She appears to be on track for confirmation. 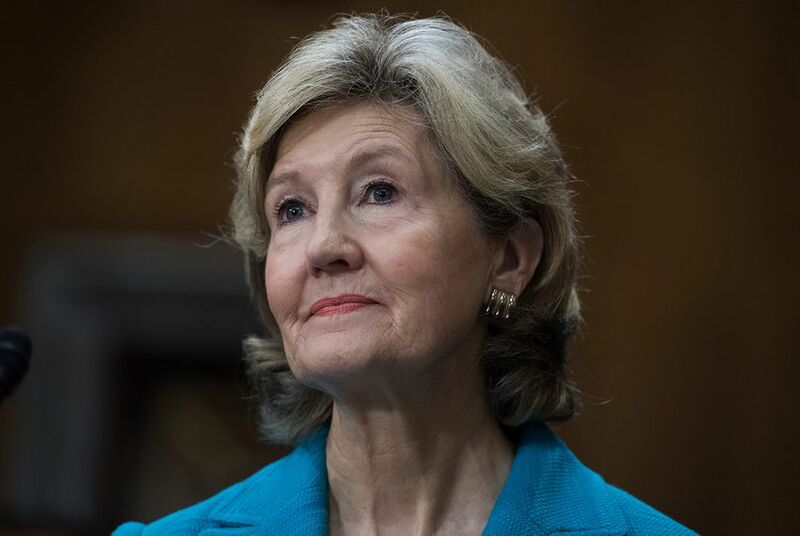 WASHINGTON — Former U.S. Sen. Kay Bailey Hutchison testified on Thursday that she would take a tough stance on Russia if she is confirmed as the new ambassador to the North Atlantic Treaty Organization. "We are beefing up defenses for an aggressive Russia," she told the Senate Foreign Relations Committee, adding that she supports lawmakers considering new sanctions on Russian in response to its cyberattacks at home and abroad. "I think that Congress is doing the right thing." Hutchison's comments were striking given that the man who nominated her to the NATO post — President Donald Trump — continues to cultivate an oddly close relationship with Russian President Vladimir Putin. Several senators, including Democrats, said Thursday they found Hutchison's positions reassuring, and they were anything but adversarial in their questioning of her. "Kay Bailey, I'm so excited you're the nominee," said U.S. Sen. Tim Kaine, a Virginia Democrat and 2016 Democratic nominee for vice president. "Your nomination sends a signal the NATO relationship is an important one." The Senate has passed Russian sanctions in a near-unanimous vote, but the legislation is stalled in the House amid procedural and partisan infighting. Most members of Congress believe Trump is against new sanctions, setting the stage for a potential veto or veto override in the coming months. In her testimony, Hutchison called it likely that Russia interfered in the 2016 American elections, a conclusion Trump and many Republicans have yet to fully accept despite a consensus among the country's intelligence agencies. Hutchison was one of several ambassador nominees who participated in Thursday's panel. Texas' two senators, John Cornyn and Ted Cruz, introduced Hutchison to the committee with high praise. “As I think about the type of individual best-suited to represent the U.S. on the world stage, I can think of no one better than Kay," he added. Cruz, who succeeded Hutchison in the Senate, joked to his colleagues that they preferred her to him. "You know I agree with the president’s effort to extract more from our allies in support of NATO. I think that’s a positive direction for our country," he said. "But I think it is also very good to have a U.S. ambassador who has a strong will and a gracious smile to represent America." Hutchison is expected to coast to confirmation. Disclosure: The author of this article briefly worked for Kay Bailey Hutchison more than a decade ago.